This page is dedicated to the customers that like to know what design concepts and technologies we are using in our latest models. Here is how our Accurate 4xx, 6xx & 7xx machines are executing automatic tool calibration. 2. Precise linear gauge (0.5 inch, 12.7 mm range, 0.00004 inch, 0.001 mm accuracy!). It measures the current position of the pressure foot (4). 3. Switch plunger, activates a circuit when its surface is even with surface of the calibration pad (7). Factory calibrated to a partial micron on a laboratory class polished granite surface. 4. The pressure foot is spring loaded, it touches the material first, approximately 0.08 inch, 2mm before the tool tip and applies a down force during the machining process. 5. The spindle holder is a precise machined aluminum block that holds the spindle, and the measuring probe and is the housing of the linear ball bearings that are used for pressure foot suspension. 6. The tools, we are using tools that have plastic rings set at 0.8 inches from the tool tip (a World wide standard for the PCB industry). 7. Calibration pad, this unit provides the necessary conditions for precise tool tip calibration. 8. Infrared sensor, this device is able to sense the existence or nonexistence of a tool, a tool ring if it comes off the tool, in the tool holder. In addition to the software tools logistics, it prevents tool conflicts despite operator’s errors. 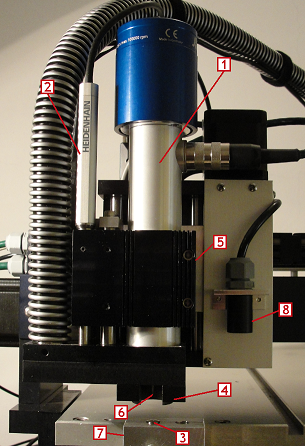 • The spindle goes over the calibration pad (7). • At this point the machine controller reads the position of the pressure foot using the Precise linear gauge (2). • This value is then used by the control program as a reference during the use of this particular tool this time during this operation. Based on the penetration setting a new reading is calculated and dynamically maintained during the machining process. The Z axis works with closed loop feedback to maintain a precise depth of cut. • Individual automatic tool calibration after every tool change cancels all errors related to the tool geometry, ring setting, material surface, collet grip, and it only takes 2 seconds to complete. • Having the actual tool penetration value at hand allows automating the special mode called “peck mode” (completely covered by our PhCNC software). This mode allows machining with a very high aspect ratio (tool penetration/tool size). It is also very useful for deep machining of the non ferrous metals and all plastics. After the individual tool is calibrated the system is using our CAST™ (Continuous Automatic Surface Tracing) during the machining process. Why choose a moving gantry? • An expensive light weight table to get the same dynamics. The competitors that still offer large table models continue to use moving gantry designs for these models (priced unbelievably high). We are using very tight production tolerances and have the precision needed without the disadvantages listed above. All our units are optically squared between the X and Y axis to the level of 0.0002 inch, 0.005 mm end to end.